Pitchero is a new social network for sports clubs and is about to launch a full platform (due in June 2008). Pitchero "has been designed specifically for semi professional and amateur sports clubs". 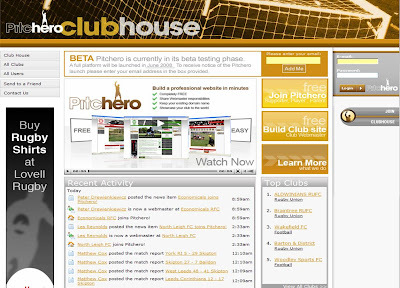 Pitchero provides every club (whatever size or structure) with a well designed website with facilities to easily incorporate photo galleries, video uploads, results, statistics and news. The idea is that this will then create a deeper involvement for both club players and supporters. The Football Association and Rugby Football Union are also interested as they have ambitious targets for sports participation and are looking for new ways to engage young people. According to the Sunday Telegraph more than 60 football, rugby union and rugby league clubs have signed up from across the UK and using angel investor money the founders, Mark Fletcher and Jon Milsom, have big plans. Great idea and follows the trend for social networking around a specific niche. This sort of site offers a more targeted way for brands to get involved with social media and I am interested to see what the full platform looks like in June.